The following paranormal phenomena statements are extracts from the first spontaneous paranormal survey conducted by Psychic Revolution. These accounts have not been edited but any information that may identify the original contributor has been removed. Go to Afterlife to read more accounts. My mother died. She was experiencing alzheimers like symptoms for many years. An adverse drug combination sent her into a near coma and after that she refused to eat or drink. She was an extraordinary person who chose to die with dignity. At the moment of her death my older brother was holding her face in his hands and talking to her while I meditated in the corner. I found myself floating above the bed and watched as her body opened up and a most beautiful and angelic being rose up hesitated half way out then soared away from her body. At just that moment my brother shook me and said Mom died. He told a story of her opening her eyes and looking at him gasping, stopping breathing, then taking one more breath and dying. He said there was such a rush of energy from her body that passed through him that he almost fainted. When I was nine, my grandmother, age 48 was dying of cancer. She knew it would be that day and gathered everyone around her to say goodbye. She was not scared, she was a devout Christian, and knew where she was going. She would often doze that night, and we would all wait to see if that breath was her last. She took a deep breath, and my grandad looked up, so did we (there was approx. 20 people in the room). My grandmother went to Heaven in the arms of two angels. We all saw them. 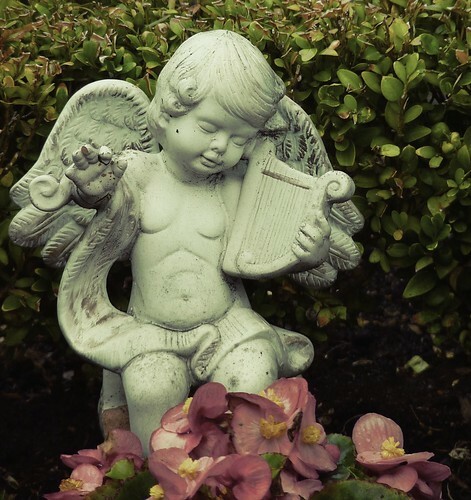 I had ordered Lorna Byrnes book about angels as she had lost her husband while he was young, and I wanted to read about her angel encounters and see how she coped with the loss of her husband. My husband was dying of prostate cancer at the time and I wanted to know how to cope with his impending death. I read the book in one sitting and went to Lorna Byrne’s website after I finished it, and found that she had a section on her website saying that you could write in and ask for help and prayers. I wrote to her asking for courage and guidance. Within 60 seconds of clicking ‘submit’, the doorbell rang. I went outside to see a beautiful young woman standing at the gate with a portfolio of artwork. She very animatedly told me she was selling artwork from door to door, and asked if she could show me the work. She started showing them and I liked them a lot even though I normally don’t like abstract stuff. Then she came to hers and said: This is mine, it is a painting of an angel. Suddenly I realized that this was the answer to my prayer which had been sent to Lorna Byrne. The answer was proof that she had heard my request and she had sent an angel to me.